Opera Chic is back tonight from a late night passed at Conservatorio G. Verdi where she basked in the glory of Grigory Sokolov's piano recital in the white belly of that huge auditorium on via Conservatorio. The program consisted of Franz Schubert's Sonata in C minor D 958 which was played technically beyond-perfect, and suffused with tenderness and a wide range of color. The usual thirty-two minute composition (with four movements) took much longer under the careful caress of Sokolov, clocking-in at around forty. His pedal work is outstanding...his legato, his staccato, his transpositions...everything. He is appassionato in the fullest sense, and this performance quickly erased all prior memories of Barenboim’s momentous (but hey, kinda sloppy and heavy-handed) recital two nights ago at La Scala. The second half of the program was, um, okay...a selection of Aleksandr Nikolaevich Skrjabin works with only a few standouts (not at the fault of the superb Sokolov, but my own incapacity to really get into Skrjabin). 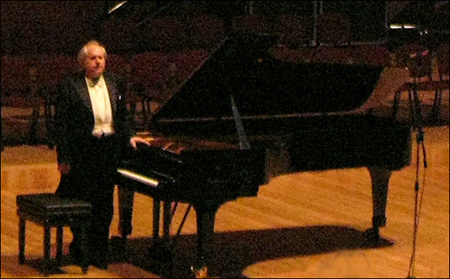 One "mistake" (we use this ironically) of Sokolov was launching directly into the astounding, trompe l'oeil splendor of "Opus 9 Prelude and Nocturne for the Left Hand", which demonstrated so much of his endless talent and received so much applause, that the following four program pieces sent the entire audience into proper applause etiquette confusion, with half the auditorium tepidly applauding, and the other half shushing them during each subsequent piece. jokes on us all. Again, his presentation of the Skrjabin work for the left hand was insane, his right hand hanging idly at his side. His phrasing and mastery of mixing legato with brighter staccato and spirito was beyond words. He used the voice of his left hand to mind-bogglingly sound like two. The Sonata No. 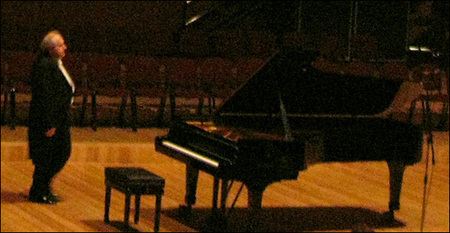 3 Opus 23 was also a standout, leaving the remaining works (Due Poemi Opus 69, Sonata No. 10 Opus 70, and Vers la flamme Opus 72) a bit of a chore (OC wanted the delicious encore already). Six bis were given, starting with a sweet andante Frédéric Chopin's Prelude in E Minor, and then including another Chopin waltz, Liszt, Beethoven, Brahms, which all brought standing ovations. Opera Chic is just glad she was able to catch this great pianist play live in such a beautiful city that cherishes its musicians. btw, we found one of Jessica's 2005 Sokolov performance reviews on a Sokolov website, and we love this quote: "And although he's a big bear of a man, he can be as graceful as a ballet dancer (take the hand crossings in the Schubert) and create sounds as delicate as a hummingbird." It's a wonderful quote because it's true! He's just perfect.